All foreign visitors, study abroad students, and tourists welcome! Reservation required/ Reservations can be made by e-mail or telephone. 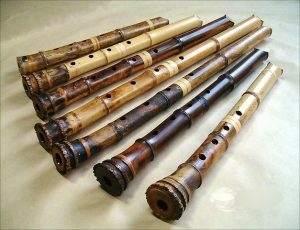 *At a experience session we using a high quality plastic Shakuhachi. 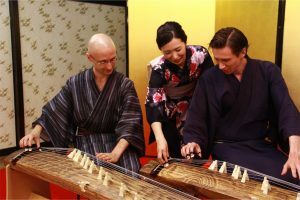 Our instructors are graduates of the Tokyo University of the Arts(national university of Japan) and hold Music Master’s Degrees. 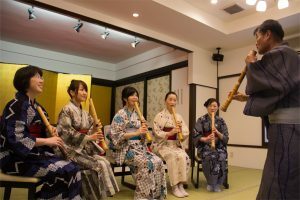 The lessons are taught in English and participants can learn both the Koto and Shakuhachi. At the end of the experience all the participants will gather to perform a traditional piece together. 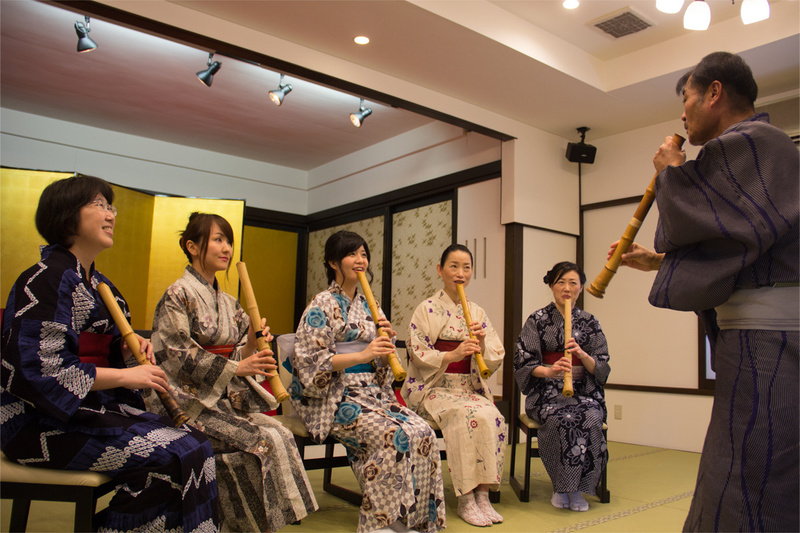 We also offer a professional performance so you can enjoy traditional arts first hand at Suga Shinto Shrine. 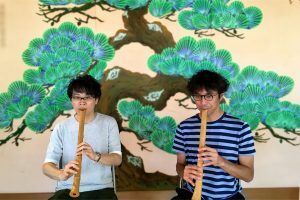 Our music experiences take place inside the Kaguraden on the Suga Shrine grounds. 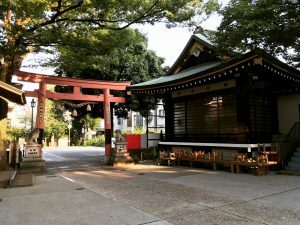 As part of this experience we will teach you proper etiquette for visiting Japanese shrines. If you’d like we can take pictures and video using simple equipment. 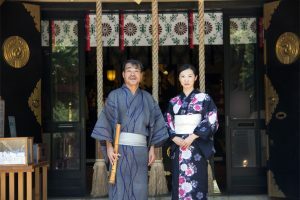 We provide a yukata service but only during the summer and quantity is limited. *Please contact us to reserve a session. *We ask a minimum of 2 participants to sign up at a time, although we can host larger groups as well. *To facilitate scheduling for our instructors, please make reservations well in advance. *We recognize that guests also may want to plan out several months ahead, so we allow reservations to be made as early as 3 months prior to each session. *Please pay in cash the day of as we cannot accept credit card payments. Groups of 4 to 7 individuals will receive a 10% discount. Groups of 8 to 10 individuals will receive a 20% discount. *Please understand that groups of 10 or more may occasionally have to share the class with other participants. *There are additional costs for those choosing to experience the session wearing one of our yukata. As start and end times are fixed for these sessions, we cannot extend a session time if someone arrives late. Please be careful not to arrive late! Each class lasts 60 minutes to 90 minutes depending on the number of participants.